ASP.NET web applications are based on stateless HTTP protocol. New instance of the web page class is created each time the page is requested from the server. So, this would mean that all data on the page will be lost when page is posted to server. Then how do we create pages with controls which can preserve data across page postbacks. But ViewState has one major drawback. ViewState property can be disabled. In ASP.NET 1.x, Custom controls had only option of using ViewState to store critical information across postbacks. But a developer using custom controls can disable ViewState which can ultimately break the control. To fix this, ASP.NET 2.0 has introduced a new kind of ViewState called ControlState which is essentially a private ViewState for your control only, and it is not affected when ViewState is turned off. You should only store data in the ControlState collection that is absolutely critical to the functioning of the control. Use ControlState to store small amounts of critical information. Heavy usage of ControlState can impact the performance of application because it involves serialization and deserialization for its functioning. This article describes the implementation of control state in an ASP.NET 2.0 web custom control. 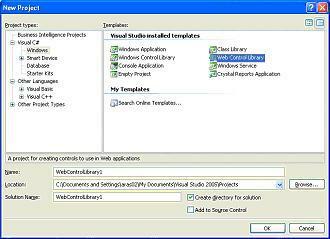 To see things getting started, download example ControlState Visual Studio .Net project, used in this tutorial. 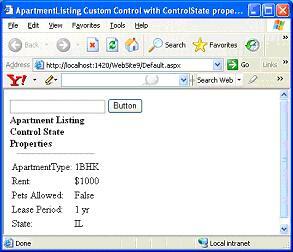 Example will show how to create custom control name ApartmentListing that uses ControlState property to preserves state across page requests. As told earlier, ControlState cannot be disabled so that critical information is available on postbacks for the control to function properly. Override the OnInit method and invoke the RegisterRequiresControlState method to register with the page for participation in control state. This must be done with each request. Override the SaveControlState method to save data in control state. Override the LoadControlState method to load data from control state. This method calls the base class method and gets the base class's contribution to control state. DefaultPropertyAttribute is a design-time attribute that specifies the default property of a control. In design mode, the properties dialog box typically highlights the default property when a page developer clicks the control on the design surface. BindableAttribute, specified as true or false, specifies for visual designers whether it is meaningful to bind the property to data. 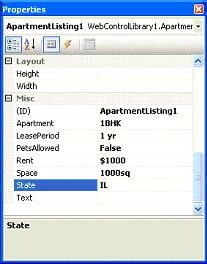 For example, in Visual Studio 2005, if a property is marked with Bindable(true), the property is displayed in the DataBindings dialog box. If a property is not marked with this attribute, the property browser infers the value to be Bindable(false). CategoryAttribute specifies how to categorize the property in the properties dialog box. For example, Category("Appearance") tells the property browser to display the property in the Appearance category when the page developer uses the category view of the properties dialog box. You can specify a string argument corresponding to an existing category in the property browser or create your own category. DescriptionAttribute gives a brief description of the property. Usually, the property browser displays the description of the selected property at the bottom of the Properties window. DefaultValueAttribute specifies a default value for the property. LocalizableAttribute, specified as true or false, when a property is marked Localizable (true), property will included when serializing localized resources. The property value will be persisted to localization source when the control is polled for localizable properties. 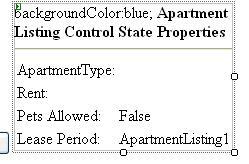 We are using structure variable to retrieve and set the properties values for ApartmentListing custom control using the defined properties for each structure element. Now, Build the solution by pressing F5 button. 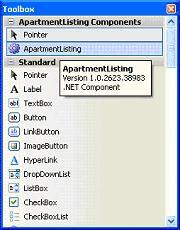 You can see the output as shown below which displays the values for defined properties for ApartmentListing control. It's time to see the magic of ControlState property. I change the value for ApartmentType property value by entering a new value in textbox and click submit button as shown below. You can see that when we click submit button, it generates a postback. After page postback, you can see that ApartmentListing control has persisted properties values across page postback. It also shows the updated value for ApartmentType property. Now you can go ahead and create your custom controls which can persist some critical data across page requests.